The government of the United States shut down at midnight on Friday after Republicans and Democrats in the Senate failed to agree on expenditure and provisions on immigration in a bill on the federal budget. This comes a day before the first anniversary of Donald Trump’s presidency on Saturday. US President Donald Trump and Schumer met at the White House before the midnight deadline to come up with a legislation on funding federal agencies. They had tried to reach a middle ground on the different demands of the Republicans and Democrats, The New York Times reported. Federal agencies in the US are funded using annual budget appropriations bills. During the vote on Friday, the Senate was divided about how the government should spend the money. Only 45 of the 51 Republicans in the 100-member Senate voted in favour of the spending bill, and one abstained. The Senate needed 60 votes to pass the legislation, but members were divided over the Democratic Party’s demand to protect from deportation more than seven lakh undocumented immigrants who were granted temporary legal status by former President Barack Obama. 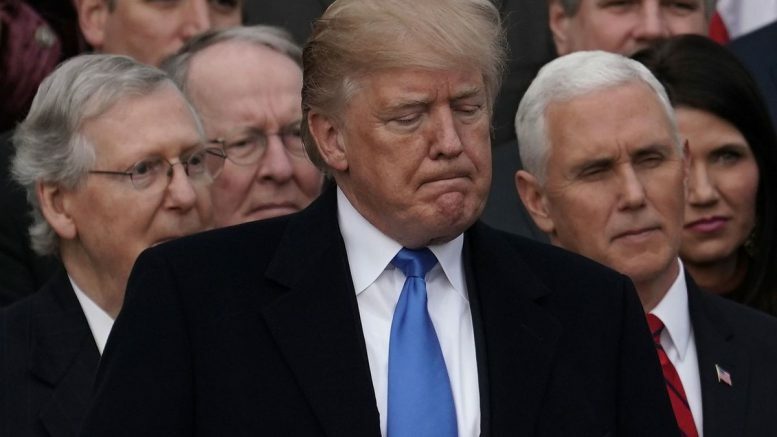 In September 2017, Trump had ended the programme and allowed the Congress to replace it by March 2018. Hours before the midnight deadline, Trump tweeted saying it was “not looking good” for the US military or safety and security in the southern border of the country. “Dems want a shutdown to help diminish the great success of the tax cuts and what they are doing for our booming economy,” he said. What does Pepsi have to gain financially from associating with Trump? Be the first to comment on "US government shuts down as Democrats and Republicans fail to agree on bill for federal funding"